While his teammates were getting dressed in the locker room before the squad’s first indoor workout of the season, Burnett sneaked out a side door into what he assumed was an empty Lamb-Miller Field House. Presumably alone, Burnett let out a primal scream: “BASEBALL SEASON!” His yell drew a glance from new head baseball coach Matt Midkiff, who was standing just a few feet away in a batting cage. Burnett’s cathartic scream could have been an embarrassing way to meet his new coach, but Burnett’s motivation was understandable. A return to the baseball diamond and to Swarthmore marked a return to normalcy for Burnett following one of the most tumultuous semesters imaginable. The 2012 fall semester began with great promise for Burnett, as he and friends Nick Constantino ’14, Matt Bertuch ’14, and Zachary Schaffer ’14 began a study-abroad program in Rome administered by Temple University. The friends settled in quickly to classes and life in Rome. A week or so into the program, however, an administrator stopped Burnett and his friends after a class and requested that they come into his office at once. “The only thing I could think is that we did something wrong, but I couldn’t think what. Now, I wish it had been that,” says Burnett. Burnett’s mother was on the phone from their Anaheim, Calif., home. The sad message: His father had been found dead from an unexpected heart attack. Burnett was devastated and returned home to California. Set on enjoying his experience in Europe, Burnett threw himself into every study-abroad opportunity imaginable, including trips to Paris, Munich, and London. The program was winding down when the American students were given the Thanksgiving weekend off. Wednesday night before the holiday, they went to one of their favorite bars on the Campo de’ Fiori. The friends chose a table overlooking the piazza and had just settled in when about 50 men dressed in black with weapons and helmets and scarves over their faces approached across the piazza, Burnett says. The attackers were neo-Nazi hooligans of the Italian soccer team Società Sportiva Lazio, set to play the English team Tottenham Hotspur that weekend and whose fans also frequented the bar. Being the first ones in their paths, it was almost impossible for Burnett and friends to escape without confrontation. Out of the mob came a man swinging what Burnett thought was a baseball bat. He ducked, but got hit in the back. Burnett broke free and ran across the piazza. Then he felt blood flowing down his back. Instead of a baseball bat, he’d been struck by a knife, which left a long stab wound. Fortuitously, a young American woman nearby calmed him down, helped him get a taxi and put her jacket on the cab seat so the blood would not ruin the upholstery. “I got to the hospital in time, and they stitched me up,” says Burnett. He called his friends and discovered they had only been slightly injured. “I had feared the worst, that they might even be dead,” he recalls. Because the knife had actually scratched his lung, Burnett stayed at the hospital for a week before finishing up the program and going home to California. After recovering from his injury and spending much-needed time at home with his family, Burnett returned to the College in January 2013. 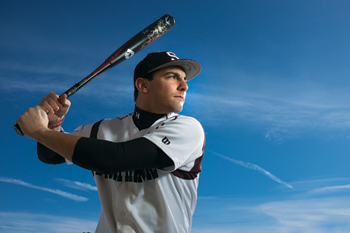 With the help of his friends, professors, and coaches, he settled back into a routine at Swarthmore and was poised for another strong season on the baseball field. Physically, Burnett says his injury did not hurt by the time baseball season started last year. It certainly did not derail his performance at the plate. Burnett, who alternates between first base and outfield, hit a team-best 10 doubles and drove in a team-best 29 runners during the 2013 season. Going into the 2014 season, he was only seven doubles and 17 RBIs shy of becoming the all-time Swarthmore record-holder in both, while also ranking in the top 10 in career home runs and hits. Emotionally, he admits the 2013 baseball season was difficult without his father. 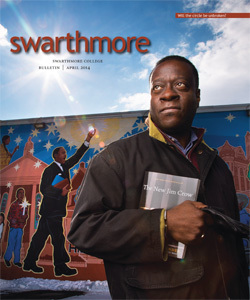 Now in the midst of his final semester, Burnett is thriving in nonathletic as well as athletic activities, the variety of which was a big reason he came to Swarthmore. An economics major with a statistics minor, Burnett is president of Delta Upsilon fraternity, an RA, and president of the senior class. WOW, What an inspiration this young man is. My son Griffin Haupert played baseball at Orange Lutheran High School with Nick. Griffin was on the frosh team, Nick was on the Varsity team, always team player and a great mentor to the younger players. Nick was voted "most likely to succeed" and he is proving that to be true.